How Are Dental Implants Damaged? There are two main parts to an implant. First, there’s the implant itself, which is a titanium post that sits in the jaw where a tooth root used to be. Second, there’s the restoration that’s attached to it, which is usually a single dental crown, a bridge or denture. Gum disease or bone loss – The implant, or titanium post, needs healthy gum tissue and underlying bone to support it and keep it in place, the same way that natural teeth do. If gum disease develops, the tissue can become inflamed and cause the implant to become loose over time. Procedure error – In rare cases, an implant surgery may not have been done just right, which can cause the implant to fail. Dental cement leakage – If too much dental cement was used to cement the crown to the implant, it might leak out and irritate the surrounding gum tissue. Wear-and-tear – Just as traditional crowns, dentures or bridges may need to be replaced after years of wear-and-tear, they may also need to be replaced when they’re attached to an implant for many years. 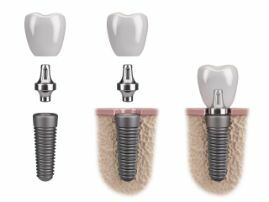 How Can Dental Implants Be Repaired? Although some cases may require a new implant altogether, a dentist in Arlington Heights can often repair an existing implant. In fact, regular checkups are an important part of implant maintenance because any potential problems can be found and treated as early as possible. For example, if a dental implant has lost bone mass around it, a bone graft to be done to restore its support. A new crown or bridge can be done to replace a failing one and there are gum therapies for gum disease that may have developed. Dental implants are widely regarded as the best way to replace missing teeth for a reason: Nothing else offers the same strength and stability that they do. That’s why it’s well worth it to maintain your implants as long as possible. When you take care of them, they take care of you! Dr. Ernie Costello is a general and implant dentist in Arlington Heights who has used implants to restore the smiles of countless patients. 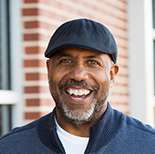 He knows how alarmed his patients feel when an implant becomes damaged, but with years of experience and advanced education, he’s able to help them get many additional years of enjoyment from them. If you have any additional questions, he can be reached via his website or at (847) 259-1111.